We had a great time at the Order of the Arrow Shawnee Lodge, #51, Fall Reunion! Garret and Tyler L, and Tyler M, joined us for an incredible Ordeal weekend. All told, there were 63 Ordeal Candidates from our Chapter, and 8 Elangomats (or “Friends,” guides for the new candidates). 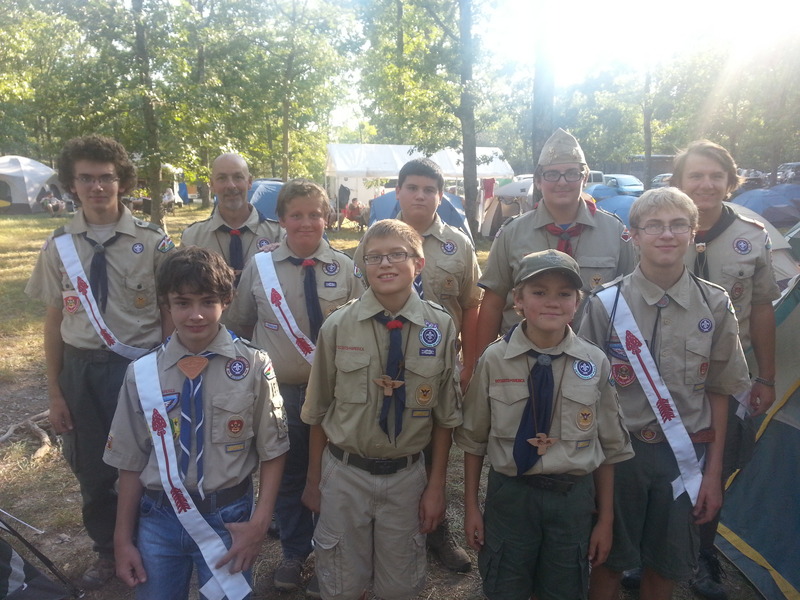 Of those eight, 6 Elangomats were from Troop 501! The Candidates toiled long and true, in silence, eating only scant meals under the watchful eyes and guidance of their Elangomats. Sounds fun, doesn’t it? It was all worthwhile, however, as after they endured their Ordeal, they were admitted fully into the Brotherhood of the Order of the Arrow, as Ordeal Honor Members. All were so worn out from the days activities that by the time Mr Hufford returned from his Brotherhood Honor ceremony, every Scout and Leader had retreated to their tent, and gone to bed. What a great sight for a scoutmaster’s sore eyes! The excitement was still so high in these Scouts (especially the renewed excitement in those Arrowmen who went to the ceremony to support their Brothers) that even as we broke camp, they couldn’t wait to talk about their desire to start their own ceremonial team, and most said they were prepared to commit themselves to completing the requirements for Brotherhood Honor by Spring Conclave.